I got the advantage of 2 months unlimited access on processexam. 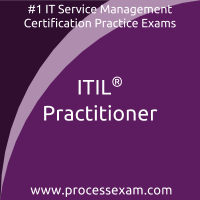 I used it to the fullest by giving ITIL Foundation practice tests regularly. As i was serious and involved, it was enough for me and also helped me to overcome the anxiety of exams. My score in ITIL Foundation Certification amazed me. I achieved this with just 2 months practice on this awesome set of mock tests on processexam. I opted for premium membership and made sure that i am never out of practice, even for a single day. This really worked for me. It is time to thank profusely to the experts who are making such a resource available to us, in such a short time. 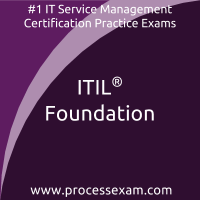 ITIL Foundation certification exam can be cracked easily. My score was 92%. I practiced on the mock tests on the online platform. The questions are not repetitive here in mock tests for ITIL Foundation certification exam and this increased my curiosity and smartness.